Chic and Silk: EVENTS: Emmy Awards 2016 - Δείτε τι Φορέθηκε! Sarah Hyland Wearing a Monique Lhuillier look with Lorraine Schwartz jewels and Jimmy Choo heels. Padma Lakshmi Wearing a glittering Naeem Khan dress, Stuart Weitzman shoes, and Lorraine Schwartz jewels. Kirsten Dunst Wearing a custom Givenchy Haute Couture glittering black gown, Roger Vivier shoes, and Fred Leighton jewels. Mandy Moore Wearing a Prabal Gurung dress; Olgana Paris shoes; Jennifer Meyer earrings; David Webb, Cartier, and Jennifer Meyer rings; and a Jimmy Choo clutch. Tina Fey Wearing a green Oscar de la Renta gown, Lorraine Schwartz jewels, and Brian Atwood shoes. Claire Danes Wearing a gold Schiaparelli gown, Christian Louboutin shoes, and Forevermark jewels. 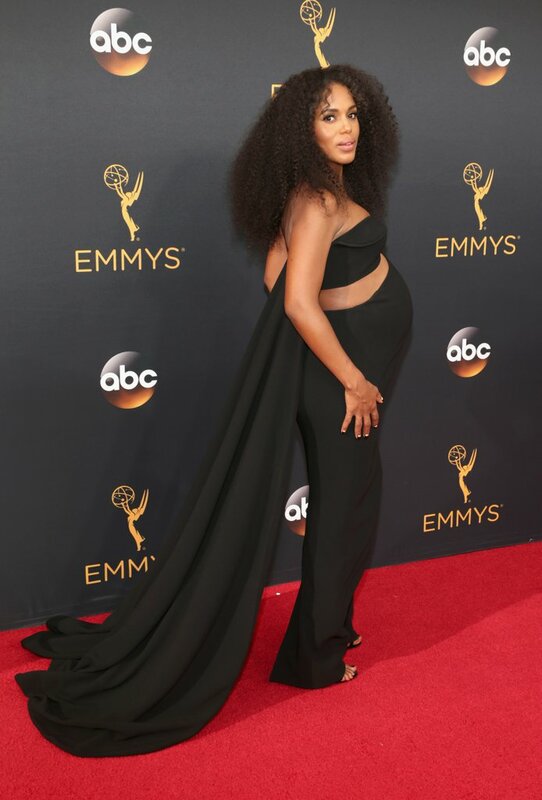 Kerry Washington wearing a black cutout custom cape dress by Brandon Maxwell, Gianvito Rossi for Brandon Maxwell shoes, Fred Leighton earrings, and Harry Winston jewels. Minnie Driver Wearing a bright yellow cutout gown, Tamara Mellon shoes, Irit Designs black diamond earrings, and a Le Vian black diamond ring. Michelle Dockery Wearing a white asymmetricalOscar de la Renta dress, Stuart Weitzman heels, and Harry Winston jewels. Julie Bowen Wearing a cream column Lela Rose gown, Lee Savage clutch, Vhernier jewels, and Brian Atwood shoes. Viola Davis Wearing a hot pink Marchesa dress, Stuart Weitzman shoes, Tyler Ellis clutch, and Harry Winston jewels. Kristen Bell Wearing a Zuhair Murad Couture gown, Harry Winston jewels, and Brian Atwood shoes. Emilia Clarke Wearing an Atelier Versace gown, Christian Louboutin shoes, Roger Vivier clutch, and Jack Vartanian jewels. Priyanka Chopra Wearing a floor-sweeping one-shoulder gown by Jason Wu and Brian Atwood shoes. Sophie Turner Wearing a romantic black Valentino gown, Forevermark jewels, and Christian Louboutin shoes. Joanne Froggatt Wearing a Stella McCartney gown with a Tyler Ellis clutch and Neil Lane jewels. Heidi Klum Wearing a Michael Kors Collection dress, Stuart Weitzman shoes, and Lorraine Schwartz jewels. Ariel Winter Wearing a metallic Yousef Al-Jasmi column gown with a leg slit, Stuart Weitzman shoes, and $500,000 worth of Harry Kotlar diamond jewels. Neve Campbell Wearing a black voluminous Christian Siriano gown with a lace overlay.